7 Reasons Anger and Conflict still exist within in the Workplace - Mastering Conflict: Anger Management, Conflict Resolution, Counseling, and Training for Individuals, Couples, and Organizations. In order for there to be a productive, efficient, safe and healthy work environment, employees need clearly defined expectations and instructions on how to carry out their daily tasks. A supportive environment coupled with clear explanations can eliminate ambiguity, confusion and ultimately conflict. Without clear expectations employees will become frustrated and leading to a prevalence of unhealthy conflict in an organization. To accurately determine the impact of anger and conflict resolution interventions there must be pre-post testing to assess the root cause of anger and conflict within the workplace and the impact of interventions on management conflict in the workplace. In the absence of such testing the impact of the intervention on changing attitudes, beliefs, or actions that affect organizational performance will simply remain unknown. There are probably hundreds of conflict resolution presentations and training programs in the market place. One common mistake made by organizations is to not evaluate the root cause of conflicts but instead providing ready-made training without address root cause. These trainings may elicit positive feedback from participants; however, they do little to address the root cause of organizational conflict. Assessing the company culture and being able to address the underlying issues with a cultural specific conflict resolution model affords the company the opportunity to minimize conflict and eliminate issues and ultimately grow into a more productive organization. Poor communication may manifest itself in the form of minimal or incomplete information regarding expectations, roles and responsibilities either from management or amongst employees. There must be clear rules about how managers communicate expectations and how they receive feedback. Conversely, there must be similar systems for employers to communicate their needs, expectations and feelings. Without that latter anger and resentment can ensue which in turn will create contention and potential conflictual communication dynamics between management and employees. Companies should be driven to do better and become more efficient in an effort to meet the need of their bottom line, however, it is equally as important to address, manage, and be able to minimize any issues that promote stress or anxiety on a consistent basis without any access to emotional relief. Stress, over time, tends to have a numbing effect on employees and management. The end result can be a lack of emotional awareness which leads to greater disconnection and with employees. Empirical research has shown that low emotional awareness within the leadership of an organization will create higher levels of anger and conflict amongst employees. Change can be confusing, yet it is inevitable. Organizations regularly go through expected and unexpected changes. It is important that organizations are intentional about the change process as it relates to how it will occur, process for informing employees and community stakeholders of the change and have a review of how the change management process went post implementation. It is also vital that change is considered as a collaborative effort so that there is some level negotiation regarding meeting stakeholder needs and expectations. If change is managed poorly, then employees and stakeholders can become angry and conflict will emerge in the organizational system. 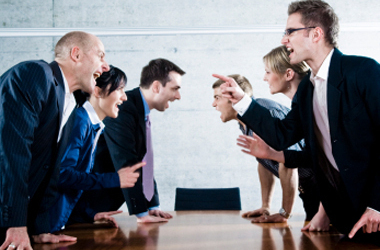 Conflict is often a sign that something needs to change in an organization. When conflict emerges, it is natural to seek ways to silence or avoid the issue as opposed to determining the root cause. Avoidance of addressing root cause is likely to create and sustain and conflict in the organization. Conflict is the catalyst for change, the conflict, although uncomfortable, is necessary to move to the next level of understanding. Conflict is necessary, and avoidance is a tool that is often used, but is a determent to emotional, personal and professional growth. The proliferation of anger management classes and conflict resolution programs has created the appearance of an easy solution to the problem of anger and conflict in the workplace. There are no easy solutions that will provide sustainable results. There is need for greater root cause evaluation, designing and delivering of problem specific solutions. Organization specific anger and conflict management programs are designed to address the unique situations within the organizational culture. Incorporating the organizational specific anger and conflict management constructs allow organizations to thrive with improved communication, reduce stress within the workplace and promote happier relationships amongst managers and their employees. Positive change as it relates to conflict and anger management is possible if the appropriate tools are chosen and proper evaluation of the effectiveness of those tools are done.